Updated 26/10. The new NHS Five Year view was published this week*. There was much wailing about an £8 billion ‘black hole’ in the finances, and stirring exhortation about ‘Getting Serious on Prevention‘. The Health Secretary, Jeremy Hunt, declared he “wants a smoke-free Britain”. Not serious to the point of recognising that 700,000 ex-smokers are vapers, and that this massive prevention effect has happened without public spending and without the public health and medical establishments doing anything (other than trying to obstruct it). If they were truly radical, the leadership of the NHS would recognise this consumer based strategy for its enormous potential and get to work on making it happen rather than sabotage it. Oddly, the doctors’ trade union, the BMA, has taken one of the most hostile lines on vaping. Is that a mistake? Or could there be money involved? * Note to overseas visitors – the NHS is the National Health Service, a largely public sector healthcare commissioner and provider paid for from general taxation (£109 billion in 2012-13 for England) and available mostly free to all UK citizens. Despite all the NHS worship that goes on in the UK, I think it is important to recall that doctors are – at least partly – economic actors and they respond to economic incentives. Not everyone knows what these incentives are, but some of them are coded into a thing called the Quality and Outcomes Framework (QOF – usually pronounced as “quaff”). This includes payments for specified activities (‘achievement payments’) by general practitioners (GPs). This QOF framework forms part of their contract with the NHS. And, it pays out for doing stuff on smoking. 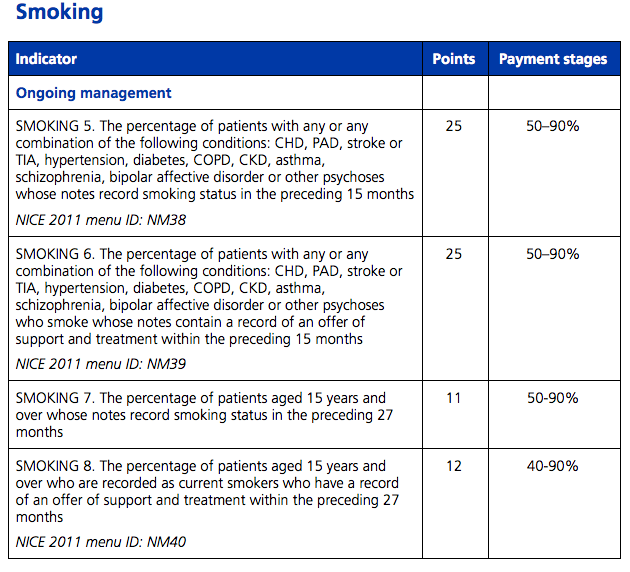 As you’ll see below, the activity in general practice covered by the QOF, and not including the smoking cessation services, on my calculation cost £88 million in 2012-13 – about £11,000 per practice and £9.56 per adult smoker – calculations in the rest of the post. In my opinion, £88 million is a lot of money in this field, and I’m not totally convinced that we need to spend this or couldn’t spend it better. I don’t wish to bash GPs – not least because they are highly heterogeneous and some are progressive beacons of hope in this field. However, it is always legitimate to look at how a system functions overall, what incentives it establishes and what value for money is achieved as a result. Update. Correction 1: the earlier version did not correct properly for the underestimate of GP list size used in the official calculations. Correcting this increases my spend estimate from £74 million to £88 million. Post updated throughout and explanation here. Apologies. Surely this is sum, £88m, worth asking some questions about now that the environment in which it was conceived has changed so much since over 2m people are now vaping with greatly reduced risk? 1. How much of what they are explicitly paid to do should GPs do anyway as competent professionals? 2. Does this spending in general practice represent good value for money – compared to other things that could be done in primary care and compared to things outside primary care or the NHS? If I may say, these interventions look easy to deliver and rather unimaginative. 3. 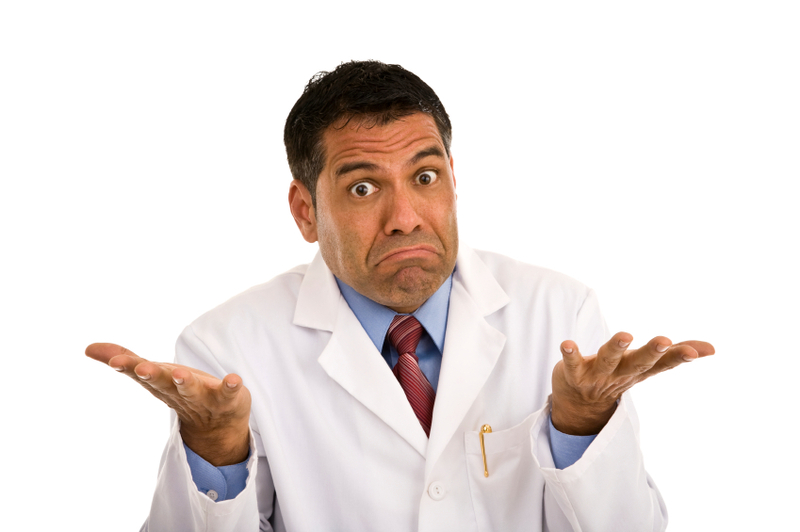 What impact on smoking would there be if doctors were incentivised to recommend vaping and provide some basic advice – or even hook up with a vape store? Would this be better value for money than what they are asked to do and paid for by the NHS? Has the obsession with medicalising vaping and classing it as smoking cessation treatment (NICE guidance) meant a more radical and fundamental opportunity is being squandered? 4. Does it help to explain why the BMA, the doctor’s trade union, doesn’t like vaping very much? If ‘patients’ redefine themselves as ‘consumers’ and decide to take a non-medical route to deal with their smoking, don’t BMA members have £88 million at stake? Is there a huge unsurfaced conflict of interest at work here, as the medical model competes with the consumer model of tobacco harm reduction, with millions of pounds on the table? Simon Stevens, new Chief Executive of the NHS, wants to be radical with the NHS and its finances and to ‘get serious on prevention’, and I believe him (see this). Jeremy Hunt, Secretary of State for Health, says he wants to end smoking in Britain. ‘Excellent’ says ASH. They are happy to will the ends, but are they really prepared to will the means? What activity does the QOF pay out for? 5.14 There is currently limited information on outcomes and quality in primary medical care. Without this kind of information, it can be unclear what expenditure on general practice is delivering. How much money is involved in QOF payments? I can’t provide an estimate for 2014-15, but there are data available for 2012-13. The indicators were different at the time – see below. A body called the Health and Social Care Information Centre provides statistics on how the QOF is working. I downloaded both England-level and practice-level data from here. The value of each point in 2012-13 was £133.76 (see guidelines). 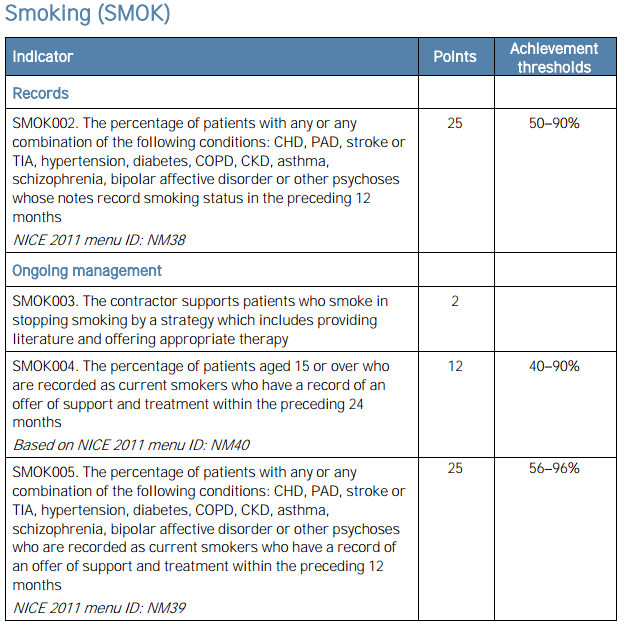 The English national data give an idea of how much the smoking part of the QOF is work to GPs.You can view and download my Google spreadsheet for this data here and view in simple HTML format here. The QOF system for achievement points works broadly as follows. A fuller explanation from the BMA – download. An area for intervention is identified – like persuading a smoker to attend a stop smoking clinic. A maximum number of QOF ‘points’ is allocated to each intervention – the points attract payments under the QOF part of the GP contract. A calculation is made of how many of the maximum points the practice qualifies for – in summary it is rewarded for reaching a high proportion of the people eligible for the intervention on its list. 1. The number of people on the practice list who would qualify for the intervention is calculated. 4. The guidance will allocate a maximum number of points to the intervention – say 25. If the practice achieves the upper expectation it receives the full points. 5. The surgery earns points for how well it is doing in the range set in the QOF – a practice achieving 80% participation where the range is expected range is 50-90% would receive 60% of the maximum points (80 is 60% of the way between 50 and 90). If the achievement is above or below the range, the practice gets the maximum or zero points respectively. 7. An adjustment is made for the size of the practice relative to the average (the English practice average of 5,891 was used in 2012-13, but that has now been recalibrated to 7,052). So a practice with 10,000 would have its points uplifted by 10,000/7,052 = 41.8% in 2014-15. I have given an example of how it works using figures for a GP surgery not far from where I live in London. You can view and download the full Google spreadsheet for this data here and view in simple HTML format here. As so often happens with funding formulae there is something nasty buried in this one. It favours better off GP practice areas at the expenses of poorer areas. The reason is that the ‘achievement’ is defined by the proportion of eligible eligible people receiving the intervention. This quantity (the proportion) is independent of the size of the registered population, or actual number of smokers. Obviously, bigger practices have to do more work and see more people. So a correction is made (7 above) to uplift by the size of the practice population relative to the average (7,052). We know that smoking prevalence has a strong ‘socio-economic gradient’ (it rises with poverty). But consider how this plays out in two practices each of 10,000, but one in a wealthy area with a smaller number of smokers (eg. 15%) and one in a poorer area with 30%. Both would get the same points for reaching 90% of their smokers, both would get the same population uplift, but the first one will have to have dealt with twice as many people. The system creates a distribution of NHS resources in favour of better off areas! How to address this (updated): the the contractor population index for each indicator should be constructed from the number of people eligible for the intervention in each practice (eg. number of smokers), not the total number of people on the practice list. This would require a CPI for each indicator, but it would be much fairer and a better way to address health inequalities. I should state that I have done my best to understand and model the the QOF from the available documentation and to check this against actual results – however the documentation and available statistics are not that easy to follow or designed to let a critical citizen to ‘follow the money’. It is possible therefore I have missed or muddled something. I’m open to criticism and will correct any blunders. Correction 1: Population adjustment. The first version did not recognise that the actual average GP registered population is larger than the registered population used for the calculation that corrects for practice size. In fact, the real England average practice size is 19% larger than assumed in the calculation (6,988 rather than 5,891 so on average). After 2012-13 the calculation has been rebased with more accurate (i.e. higher) numbers assumed as the average, but the value of each point has been increased to keep the cost approximately neutral. The effect is to raise my estimate of the amount spent through the QOF in 2012 by 19% – or £88 million rather than £74 million. Apologies. DOI: I am a GP working under contract to the NHS. Bit of confusion here…. The QOF system of paying GPs (for all sorts of basic “core” services as well as the less clearlly beneficial ones like the smoking-related stuff) came in in 2004 to replace what was called the Red Book, a hugely complicated way of paying us for “items of Service” as they were then called. It was, and is, not about bonuses but about basic pay., not just for our own salaries but for practice expenses including paying staff. At the time, GPs said to the DoH “do you really want to change the system like this?- because we are already doing most of this stuff and you’ll end up having to put our pay up”. But that was what they did, and GPS’ pay went up as a result, though the vast majority have seen a real-terms drop in pay every year since then. Sometimes when the DoH suggest an optional “enhanced service” , if it seems dubious to us then we don’t do it. The topical example would be that of screening patients for dementia, with a £55 payment to a practice for a new diagnosis, which a lot of GPs are not going to take up, as many of us feel that early diagnosis for a condition which is at present sadly untreatable is going to cause far more distress than benefit (if people actually come to us saying “I’m a bit forgetful and it’s worrying me”, that’s obviously a different matter )., and accepting payment for this (given that it’s not a £55 we can really use to help the patient in question) could be seen as unethical. Catherine makes a respectable argument here… That essentially this is just basic pay that they would have been entitled to anyway, pre-QOF. The idea of QOF then is simply to attach a few conditions for basic pay just to make sure at least some stuff gets done. The 2004 GP contract negotiation was possibly the worst deal ever achieved by the employers side in the NHS and the BMA could barely believe their luck. But 2004 is a long way back and many GPs saw huge pay growth in the aftermath. The payments are structured as activity payments so we perhaps have a reason to treat them as such, regardless of the history. There is so much one could write about GP funding. But the thing that gets me is how poorly the system aligns resources with poverty-related need. there are always shortages in the poorest areas. I agree about the dementia payments. Perhaps it is a coincidence, but the person who negotiated the disastrous contract as head of the NHS Confederation in 2004 is now the chair of the Alzeimers Society. It should be 20mg/ml. Shows how much they are really interested. That is really interesting. Thanks for the enlightenment, Clive. I know my GP asked me whether I smoked when I was having treatment for depression. And he was quite happy to give me a prescription for NRT of my choice – never followed up on how I was doing on it and even when I told him I had started using e-cigs he made no note of this. Maybe this article explains his strange behaviour! I used to work in the civil service and there were many targets against which our “performance” was measured. Most of these measured activity rather than outcomes, and many had very unintended consequences because they had not been well thought out – this was the topic of many a conversation over lunch or in a smoke break. These targets for GPs seem equally badly designed, but are even worse in that they are costing the taxpayer real money – and depriving important NHS services the funding that would make a real difference to peoples’ lives. Any mistakes in my calculations are mine alone and I take full responsibility for them. According to a very rough but broad-sourced analysis I made for the year 2012. Worldwide EBTDA profit from cigarette sales was in the 30 billion US region. Worldwide Pharma EBITDA profit from cigarette related disease was also roughly 30 billion US. Can you supply more details? By “Worldwide Pharma EBITDA profit” do you mean profit from sales of NRT and related subsidized therapies ? I think it is reasonable to estimate global pharma earnings from smoking-related channels as a minimum of 5% of gross – therefore about 5% of the $1 trillion global pharmaceuticals market. 5% of $1tn = a lot more than a few tens of millions. That wouldn’t even pay for the cost of propaganda (marketing + junk science) they expend on attacking vaping and protecting smoking, never mind the ‘lobbying’ costs. Smoking is enormously profitable for pharma and they do their utmost to protect it. Who wouldn’t when the average cost of just one course of chemotherapy is $27,000 to the patient, in the USA. Purely for interest,there was a presentation at the last UKNSCC which partly attributed the fall in SSS numbers to “declining GP engagement” – as well as to ecigs. Rather than asking the BMA,it would be great to have a survey that asks real GPs what they really think. Interesting! They seem to be mopping the QOF payments pretty successfully. The authors of this were ‘speculating’ (i.e. have no evidence – or maybe some anecdotal). It is possible that GPs are engaged on smoking, but not on Stop Smoking Services. I agree that it would be good to hear from pragmatic front-line GPs. The BMA committees and staff that deal with all this don’t seem to have much idea about the people they are supposed to be helping. I don’t really know-one of the graphs in the presentation shows SSS referrals from primary care falling from 340k to 248k between 2009/10 and 2012/3. Given the 85%+ ‘success’ rates achieved by practices,this seems a poor return based 9.2m smokers. Given the ‘lifetime’ success rate of SSS is ~5% and SSS costs around the same as QOF(exc NRT etc) one wonders if a little private sector intervention wouldn’t go amiss! If we stopped public funding for this QOF,SSS,NRT et al,DH TC group,PHE TC group,all local govt TC groups,all TC activity at univs of Bath,Nottingham,UCL and Stirling etc and all grants to charities then we could pay GPs to hand out free Vype Epens with VBA! Very interesting. An exemplar of the phrase: “follow the money”. But not in the least bit surprising. The pogrom directed at smokers has always been motivated by ideology and money. The ‘health’ aspect has only ever been a malleable means to an end. Why does this “points system” repulse me so much? I have always wondered how it worked. Thank you for posting this and educating us. Being paid to promote anything – anything at all, seems profoundly corrupt! I think I must be naive about how “good” is done in the world. But this soils the medical profession for me. I have been illuminated! What you have written here is only the cost of the points system to the NHS. That is what I am understanding. But the costs of salaried anti smoking staff running their “clinics” and all the patches, pills, gums, inhalers etc that are dished out to massively profit the manufacturers of them, are extra to this, yes? Ever since the NHS have been in financial straits, I have wondered why some sane person doesn’t suggest dumping their stop smoking services all together. And the Government should stop funding “charities” that promote “smoke-free” anything too. This way, the NHS will save vast amounts of wasted money, and the lobbying “charities” would collapse from lack of money/interest from the public. How artificial and cold is the health system as it has been contrived through bribery. Ah! That’s why my doctor has stopped liking me.